Water from a fire hose is directed horizontally against a wall at a rate of 50.0 kg/s and a speed of 42.0 m/s. Calculate the magnitude of the force exerted on the wall, assuming the water’s horizontal momentum is reduced to zero. This is College Physics Answers with Shaun Dychko. This question tells us that the mass per time of water that hits the wall is 50 kilograms per second. 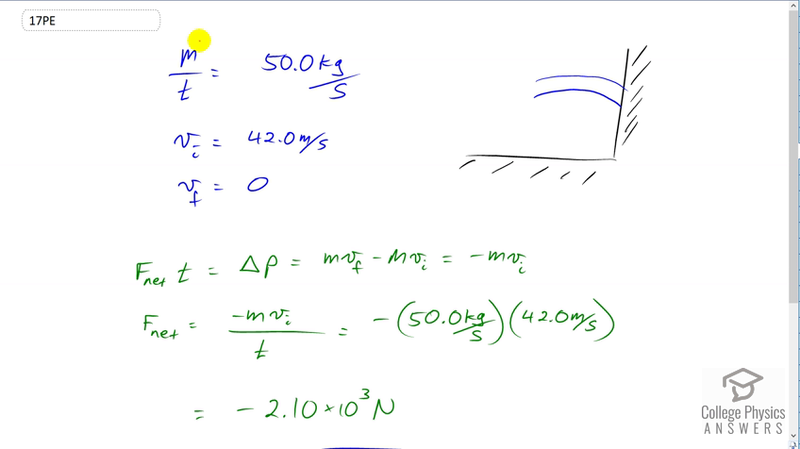 It's helpful to write this as mass divided by time because we'll see when we rearrange our impulse formula and have m divided by t, it means we can directly substitute this 50 kilograms per second in place of this fraction m over t. The initial velocity of the water is 42 meters per second. We'll take to the right being the positive direction, and that's the initial velocity direction as well. The final velocity of the water is zero. So the impulse, net force times time, is the change in momentum, so that's m vF minus m v i, the final velocity is zero so we have just negative m v i here. We'll divide both sides by t and we get that the net force on the water is negative m v i over t. We'll substitute 50 kilograms per second in place of m over t and then substitute 42.0 meters per second in place of v i. We get negative 2.1 times ten to the three Newtons. Now the force on the wall is what the question is actually asking for. Well, let's just draw down what we've got so far. What we've just calculated is the force on the water is negative 2.10 times ten to the three Newtons and that's pointing to the left. I don't usually write negative in my drawings do I because the direction of the arrow already tells you whether it's positive or negative. So, this force is to the left, that's the force on the water due to the wall and so the force on the wall due to the water is the Newton's Third Law counterpart to that, and so it's going to be the opposite sign of the force on the water due to the wall. So it's going to be 2.1 times ten to the three Newtons.